On Sale £29.95 - all incl (No hidden extras). This is a great option for anyone on a budget who wants to drink clean purified tap water and save a lot of money on bottled water. 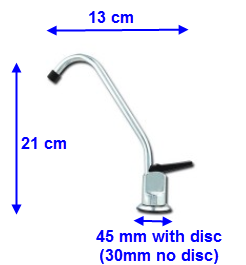 This system features a high quality taste and odour in line water filter. It uses Granular Activated Carbon to remove contaminants such as chlorine from your tap water. Full and easy fitting instructions are supplied. The price of replacement cartridges is between £11 to £13 depending on sales. Just recently purchased your budget water filter kit from your company,having read the excellent reviews on line I took the plunge and rang your company to ask for advice as to which system I should order. The gentleman who answered the phone was really helpful and pointed me to the budget system as being more than adequate for my needs, he did not try to sell me a more expensive one which really impressed me. My plumber fitted the system and was also very impressed with the kit along with my total satisfaction at the way your company dealt with me. I got the feeling he will be highly likely to order the same kit it is not often you get that service and for my part along with my wife equally pleased we are telling all our friends. I am now going to order the safety valve as mentioned in your current email. My suggestion is keep treating your customers in the same way and you and your business cannot go wrong. Your company is great to deal with, the products are always good and the delivery is satisfactory. I also like the fact that a member of staff telephones to remind me when a new filter for the system is likely to be required. I have been using this product for three years and I am very pleased with the clarity and taste also it is so easy to fit the refill which is replaced every 6 months at a very reasonable price the company always remind me. Have used this for 3yrs now and am very happy with the product also the service as they always email me when the refill is due and is a very quick delivery. Prompt delivery. Excellent product. Very happy with the experience of using them. All arrived in no time at all and I finally got round installing it at the weekend - and what a pleasure finding the little nifty shut off valve - what a super idea! - thank you so much! The installation was super easy - well I already had a tap fitted. But it's good to know that the next filter exchange will be a doddle. No doubt you will remind me in time! looking forward to your mail in 6 month time. I've been looking for a compact system that would fit under our cluttered sink for months, this fit the bill perfectly & makes our water taste much better. I know nothing about plumbing but got lots of help via email before making the purchase, and offers of further help afterwards, the team here couldn't do enough for me. Brilliant customer service! Excellently priced system.Under £30-filters around £15 to replace every 6 months.Very impressed with the quality given the low price......and dead easy to install! !